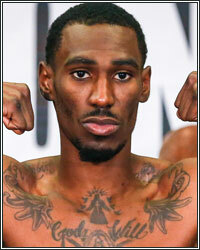 Robert Easter: It’s always a pleasure to fight in Brooklyn in front of my fans on the East Coast. I have a big fan base out there. You’re going to expect the same or even greater in this fight for me. Another victory, it may come by knockout. It may come by knockout. Q: Do you feel like you are a little bit of a forgotten guy in your weight division and you want to wake people up to the fact that you shouldn’t be? RE: I wouldn’t actually say I’m the forgotten guy. I’m just the guy they don’t want to fight. You heard these interviews, these guys talking. They always bring up everybody else names except for mine. You cannot forget about me. I’m tallest in the weight class, maybe the fastest and probably one of the strongest. Of course they’re not going to mention my name because they don’t want to fight me. I’ve been calling these guys out. I know they see that. So how can they not acknowledge that. Jorge Linares and Mikey Garcia, they’re doing their thing. They’re winning these fights like champions supposed to. But it’s time we unify these titles like I’ve been trying to do. Q: Can you tell me from your side of things how serious that discussion about fighting Mikey Garcia was and what that was about? RE: I wanted to fight. It was serious on my side. I wanted to fight. I didn’t care where at. I don’t care about any of that. I wanted to fight. At first it was I didn’t produce enough fans or the fight didn’t make sense, which that didn’t make sense, and some other excuses the guy came up with. But like I said, I was ready to fight whenever, whatever, how much. It didn’t even matter. We didn’t actually get an offer. I guess they made an offer towards him. Like I said, I didn’t really care. Q: Do you feel like you’re just a huge favoured in this fight against the smaller guy? RE: Yes. But, I’m taller than most of my opponents. That’s nothing new. Of course I’m the favourite. I’m the champion. And he’s a former world champion. These guys haven’t faced nobody with the skills of mine so you’re going to see another great performance from me in this fight. I would like to make the same statement I’ve been making and that’s why these guys are scared to fight me. Q: How much longer do you think you can hold 135? RE: I can hold it just as long as they want me to. But like I said, I’m trying to unify these titles and then move up after that until my goal is reached. For now, I’m going to be at 135, giving these guys trouble. Q: If you win this fight here against Fortuna, do you think it’s realistic that some of the other guys will give you the chance? RE: When I win this fight. I don’t know. I’ve been calling these guys out for a while. It’s kind of up to them. I’ve been sitting back, taking these mandatory fights and fights that really don’t make sense like unifying the titles will. Hopefully all the champions meet up and fight. So when I win this fight, hopefully. Q: If you aren’t going to get the chance to fight one of the other 135 guys, is it possible that you go up to 140 for your next fight? RE: I don’t know. We’re going to sit back and talk to my camp and we’re going to see what’s the best move after that. Q: Looking at Fortuna, he’s obviously a leftie, is there anything that you have to do training-wise or that you have done training-wise in preparation for him? RE: I’ve been facing left-handers my whole career, amateur and pro. I have to make a few adjustments. That’s what professionals do when they get in the ring. That’s why I really don’t study tapes or nothing because they might not fight you the same as what they fought the last person or how they fought an orthodox fighter. So it’s all about making adjustments once you get in that ring. Whenever I’m in the gym I always give it 110% and I always train till I ain’t got no more left in the gym. Q: When you’re looking at this fight going into it, what’s the thing more than anything else that you want to gain from fighting Fortuna? RE: Just keep putting on like I’ve been putting on. He’s going out there making these statements, telling people that “I can’t be beat.” Not only him but these other fighters. As you can see, none of the champions are heading my way, so obviously I’m doing something right. Q: Do you get a sense maybe the Mikey Garcia fight might not happen for you because he doesn’t necessarily want it for one reason or another? RE: I’m sensing that. But if both camps come to agreement, I’m hoping we can face off one day – not only Mikey though. You still have Jorge. You still have him. He’s still a champion as well. Q: Are you looking at it may be like if Garcia decides to stay at 140 pounds that the Linares fight is a fight that you could make for your next fight assuming you win on January 20 also? RE: Of course. It doesn’t matter if he stayed or he didn’t. I still wanted that fight. Like I said, I’ve been ready to unify these titles for so long. I’ve been sitting back waiting not only on Mikey but the other champions. Flanagan, he has moved up. And now we have Linares. Q: What do you think of Linares from what you’ve seen from him? RE: He’s a crafty fighter, fast, moves a lot, but nothing I haven’t seen before. He’s nothing special I haven’t seen before. Q: Fortuna’s obviously said a lot of things over the last week or so about knocking you out and the referee’s going to have to save you and things like that. What do you make of it? RE: Those are things he’s supposed to say. He’s supposed to hype himself up, and he’s supposed to hype the fight up. But he and his camp knows the truth. They know what they’re getting themselves into. I don’t really have to trash talk. My work is done in the ring. January 20 we’re all going to see that. Q: So Robert do you think that this is just hyping the fight, or do you feel he has the power to knock you out? RE: Of course they’re just hyping the fight. He has had power in the lower weight classes. But like I said, all that goes out the window once you get hit. Once he gets hit by what I’m bringing, then all that talking is going to go out the window. He hasn’t faced nobody with the skills I have. He’s been knocked out for one. He’s telling me I got to reinvent myself. He has to reinvest himself. You know, that’s why he’s trying to become a champion again as you said. You know, so I’m already a champion. I’m already in the shoes he wants to be in. January 20 we’re going to put the gloves on. We’re going to get in that ring and I’m going to come out victorious like I’ve been doing. Q: Do you feel that you can put together an offer to those other parties like Garcia and Linares to bring the fight to your hometown where you are popular? RE: That’s just a lame excuse to say when I fight, I don’t produce enough fans. What does Lipinets do? No disrespect to him, but come on now. Everybody knows that is not true. I have fans all over. My fan base is big, and it doesn’t matter if we fought in a room with nobody. It shouldn’t even matter to both parties, is the money good and the contract’s good, then we should fight. I wouldn’t care about fighting in front of nobody because I know what I’m going to do. Q: When it comes specifically to the Mikey Garcia fight, is there maybe something personal there because of your promotion/affiliation with About Billions and Broner having that last fight with Mikey? What is it that you see or seem that you feel that you can do better than your big bro? RE: This has nothing to do with AB. This has everything to do with Mikey being a champion at 135 and Jorge Linares being a champion at 135. It’s time to unify. If I was that much of an easy fight for them, the fight would have been made. After the offer they gave Mikey, it would have been made. It just didn’t make sense. I don’t make no excuses. I’m coming to fight and they know that. Q: Robert, just wondering if you can talk about your connection to your fans in Toledo and if you expect a good turnout at Barclays Center? RE: My connection to my hometown fans, my fans is important. I try to respond to almost each and every person who reaches out. People be so amazed that I do say something back on Twitter or Instagram or Snapchat. All my fans is real, especially my hometown fans. They love traveling to see me fight because they know where I come from. We all grew up together. I’m first hand here. I’m one of the only things they got that’s still here, that’s hands on with them. So they come and show support. I love that they always step out whenever they know I’m fighting. Q: You had good offensive performances in your last three fights but couldn’t get a stoppage. So Javier is a very tough opponent but I’m just wondering if you’re gunning for a knockout, if you’re motivated to try to get back on the knockout track? RE: Shafikov was a tough opponent. Richard Commey was a tough opponent. Cruz is tough. All these guys are tough. We’re preparing. We’re making adjustments in the ring. And if a knockout comes, it comes. I’m not going to shoot for a knockout, but I know I’m going to set something up to where I can knock him out. But like I said, if it comes, it comes. But ain’t no way he’s going to beat me. He knows that. His camp knows that.